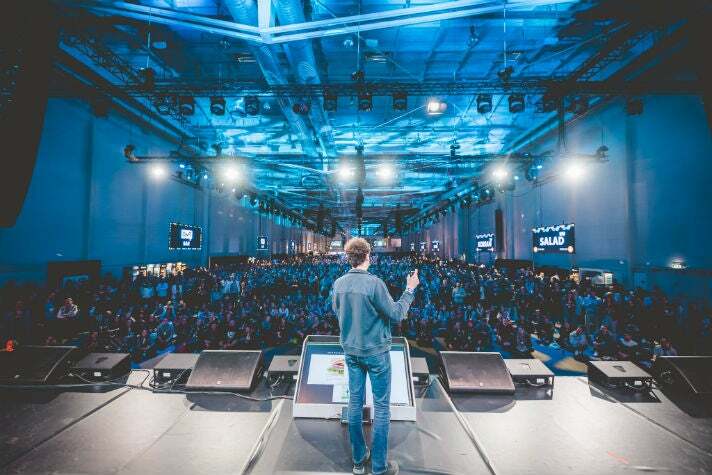 400+ exhibitors, 1500 CMOs and 5000 brands at OMR19—why wouldn't you come to Hamburg this May? Hard to believe, but true. The OMR Festival 2019 is right around the corner. As such we’ve begun prepping for when doors open on May 7 & 8. That means the office is filling up, the team is putting in long(er) hours and selling exhibitor booths for the Festival. We are absolutely thrilled by the resonance we’ve received from our partners, as well as the trust they’re placing in us once again. There is still time for you to showcase you and your company’s goods and services to the best and brightest marketing heads. Here’s a look at which companies are board so far and why it makes sense for you and yours to get to OMR. Last year, our halls were filled with 40,000 attendees. To make sure that we’re able to house a few more attendees and exhibitors, we’re heading over to the other, more spacious side of the Hamburg Exhibition Center for OMR19. In addition to heavyweights like Audi, Adobe, Google, Facebook and the like, we’re also always interested in getting exciting young companies to the Festival, whether it’s with a booth or a creative way of getting them involved. Drop us a line at sales@omr.com. Premium Booth: Hall B5 is the Premium Hall, where—just as in years past—our Premium partners and their massive booths are located. Booths here can be custom designed and our team can provide you with tips on what tends to impress the most. As the name implies, the Premium Hall is for premium exhibitors only—and that also applies to the Expo Stages this year. The Big Picture Stage, previously located in the Premium Hall, is being relocated to a separate area. Expo Stand: In Hall B6 is the Expo Hall with smaller, pre-fab booths. At OMR19, the Expo Hall will be much larger than in years past. Masterclasses: One of the most popular OMR formats, our Masterclasses are sold out every single year. (The application process for prospective attendees will begin in a few weeks). With high demand, comes higher supply; in 2019 we’ve increased the number of Masterclasses to 150. Here you can go into detail on your product in these 90-minute deep dive seminars. Expo Stages: Just like last year, there will be two stages in the Expo area with non-stop content. The “Big Picture Stage” and the “Deep Dive Stage” are the baby brother and sister to the big Conference Stage, and are available for free to every visitor at no extra charge. The “Big Picture Stage” is where the biggest marketing topics of the moment, e.g. influencers, video, adtech, eCommerce and others, are analyzed from a strategic perspective. On the “Deep Dive Stage,” our speaker lineup will take a closer look at a given topic and provide you with actionable strategies you can use. One thing stands out after taking a look at confirmed exhibitors to OMR19: the vast majority of past exhibitors are back again for another go. To give you an impression of who’s coming to Hamburg on May 7 & 8, we’ve put together a short list. If you want to join the Festival, drop a line to our Sales team right here. If you would like to be a part of OMR19, reach out to our business development team. They’re happy to advise you on how to make the most of your presence at the OMR Festival and are always good for a couple of outside-the-box ideas. Get in touch before it’s too late!